The cannabusiness may be booming, but interested job applicants around the country are still in the dark about how newly legal businesses operate, who they employ and what the average salaries for marijuana jobs are. Average salaries for marijuana jobs depend on location, which sectors of the industry are implicated and the job description itself. While some careers offer qualified candidates the chance to make six figure salaries, other jobs reflect the American norm for compensating entry level and customer service positions. In attempt to shed some light on average salaries for marijuana jobs, the following is provides an overview of what jobs are out there and how much they pay. Not surprisingly, entry level jobs comprise the lowest paying positions in the industry, with wages beginning at minimum and increasing by a dollar or two dollars per hour depending on experience. Entry level marijuana jobs are largely made up by salespeople working in cannabis dispensaries. Additionally, sales representatives who work on behalf of processing companies are considered entry level workers as well. Bud trimmers represent one of the few entry level marijuana jobs not in the customer service sector. Cannabis dispensaries provide some of the hottest entry level jobs for passionate stoners looking to begin cannabis careers. Upon entering a dispensary, it’s likely you’ll encounter a receptionist. This position may seem easy at first glance, but receptionists are key in making sure dispensaries maintain compliance and keep detailed, organized records of operations. Budtenders, on the other hand, are the astute, friendly cannabis aficionados that help customers select a great product. Budtending is considered an entry level pursuit, but this highly competitive position is a kush job to land and a great springboard for advancing into more powerful positions in the cannabusiness. Overall, entry level dispensary jobs are commensurate with other service industry positions. Average salaries for marijuana jobs in budtending and reception begin at minimum and average between $11-12 per hour. See Marijuana Dispensary Salaries for a more in-depth look at common compensation rates for marijuana dispensary associates. Dispensary jobs may not pay a lot outright, but many pot shops promote from within, so working as a budtender or receptionist allow for promotional advancement and salary increase. Some dispensaries allow tipping, while others strictly prohibit them, in hopes to drive hourly wages up. Additionally, working at a dispensary often comes with significant employee discounts and access to a large network of other cannabis industry professionals and connoisseurs. Working as a dispensary receptionist requires long periods of sitting and data entry. For those who desire a more intellectually stimulating job, this may be a bit slow. Budtending experiences similar lulls and requires extended periods of standing. Both positions demand excellent customer service, requiring dispensary staff to leave their personal issues at the door and conduct themselves professionally everyday. Outside of the service industry, the most popular entry level job in the cannabusiness is bud trimming. Trimming is the necessary process of culling cannabis buds from surrounding plant matter by snipping away at excess sugar leaves and any unneeded substances. This process is multi-faceted, as it allows for a better tasting, less harsh smoking process and a higher concentration of THC and CBD. Bud trimming essentially gives customers the best product at the lowest weight, for the lowest price. Trimming is frequently described as tedious, but in reality, most trimmers choose the job because of its repetitive nature. Trimmers work silently and can listen to music or audiobooks, as long as they don’t detract from efficiency. Considering its entry level status, trimming jobs actually pay pretty well. 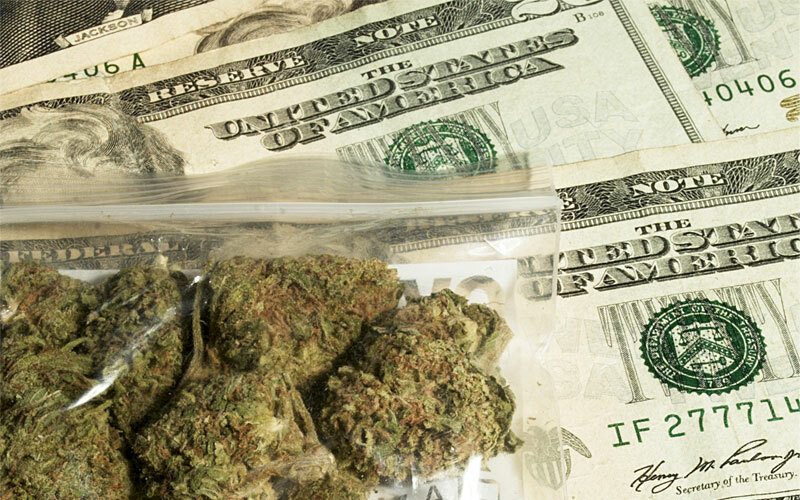 By the hour, the average salaries for marijuana jobs range anywhere from $12-15. Speedy, precise trimmers are in high demand and are paid accordingly–these individuals are often paid by weight and can make upwards of $20 per hour. Not bad for spending your shift with fresh cannabis. While it can be tricky to separate the big fish stories from real black market industry events, bud trimmers have historically been allowed to take home significant portions of cannabis flower and trim. Even if the average salaries for marijuana jobs of this kind aren’t extremely high, the perk of free weed is a significant sell for those who would normally spend a pretty penny of cannabis. Those who cringe at the thought of sitting silently for hour, clipping leaves off of buds over and over again, this is not the job for you. Bud trimming is engaging, but can get boring. Also, the sticky resin from the buds requires workers to wear disposable gloves and worn out clothes. Not only has the legal cannabis industry created more jobs, it created new ones as well. With increasing demand for marijuana in the form of edibles, concentrates, tinctures and more, solid careers have cropped up to facilitate the creation of these crowd-pleasing products. Yes, that’s right. Some of the most sought after, talented chefs in the industry today are cooking with cannabis. As marijuana edibles have progressed from firecrackers and boxed brownies to drinks, savory items and sauces, uniquely skilled chefs use their knowledge of cannabis and culinary craftsmanship to make tasty treats that get you baked. Finding a job as an edibles chef isn’t as simple as you may hope–qualified applicants have professional experience working in kitchens, or have attended culinary school. Edibles chefs are responsible for complying with all government mandates, which means they cannot consume their creations on premises, once cannabis has been infused. Breaking into the industry as an edibles creator may not be immediately lucrative, but allows for cooks to establish a strong presence in the kitchen. The average salaries for marijuanajobs cooking edibles is between $28,000-40,000, though high ranking chefs or processors can make significantly higher wages beginning at $50,000 and ranging up to $90,000+. Being an edibles chef taps into a love for cannabis and cuisine. This position allows for artistic experimentation and precise measurements, and gives chefs an opportunity to diversify their skillset. As I mentioned above, one of the downsides of working as an edibles chef is the regulatory oversight that occurs in processing kitchens. Chefs are held to a very high standard and must follow the rules if they are part of a commercial operation. Cannabis concentrates are taking the cannabusiness by storm with growing numbers of medical patients and rec customers looking for potent, “purer” pot. Concentrates are made into a variety of textures and consistencies that can be smoked, vaped or infused into edibles. Without going into too much detail, extraction technicians are tasked with the process of transforming raw cannabis plant matter into concentrates by introducing solvents, (ie. CO2, butane, ethanol) heat and pressure to change solvents into supercritical forms. This process separates the unnecessary substances like chlorophyll from the desired cannabinoids and terpenoids. Once the extraction has been carried out, the refinement process helps to ensure a high level of purity. Substances come in the form of waxes, shatters, honeycomb, crumble, oils and more. Concentrate creation is not an entry level pursuit, given the potential dangers of fire and chemicals. The extraction process can result in a vast range of outcomes, which is why only qualified applicants with degrees in chemistry or associated sciences need apply. Due to the high level of responsibility placed upon these employees, the average salaries for marijuana jobs in concentrate creation land around $100,000. Working as an extraction tech is a very satisfying path for science-minded cannabis lovers who want to help create the most effective, medically implicated cannabis products out there. Because the pay is good for concentrate creators, this position offers some security for qualified candidates. Aside from safety risks, a con associated with concentrate creation is the possibility of an incorrectly processed product. This result can be frustrating given the amount of time and energy required to create great extractions. One sector of the cannabusiness that has consistently drawn job seekers to the west coast is the cultivation industry. The fantasy of getting paid to grow beautiful cannabis flowers peaks the interest of individuals across different industries and offers an invigorating change of pace for those passionate about cannabis. Grow operations can take place inside or outdoors and require a diligent worker and a skilled hand. Master growers lead a team of assistants in germinating, transferring, cloning and harvesting mature cannabis. Establishing and maintaining grow operations requires exact and often expensive planning and setup that facilitates the correct watering, feeding and management of cannabis plants. Depending on the level of growing experience and level of responsibility, average marijuana grower salaries come in at around $120,000. Master growers are compensated for their professionalism, past results and potential for a successful season or crop cycle. Cultivation careers are suited to individuals who like working as part of a team, but prefer not to engage in customer service. Growing allows for employees to work outside, or in a grow op, tending to plants in relative silence and focus. Working as a grower takes a major toll on the body and the mind. Physically, cultivation jobs demand individuals who can stand, bend over and crouch for extended periods of time without losing steam. Successful growers may make good money, but they earn it through hard work. The nature of the current cannabis job market comes with a lot of unanswered questions and a lot of raw data. As the industry continues to find its footing post-legalization, time will tell how government regulations and corporations will influence average salaries for marijuana jobs and cannabis culture in general. The legal cannabusiness has the potential to not only bolster state and local revenue, but to create better paying jobs for entry level and experienced job seekers.